Dagnabbit, almost sprayed coffee all over my monitor. MLQ3 has a good gig: he’s respected, gets to have his opinions read by people who can make a change, gets to travel all over the world, but it’s during times like this when it’s difficult to envy him — when he has to sit through another GMA SONA so he can report on it, unlike the rest of us who can choose to ignore it. Concise indeed but on the mark. 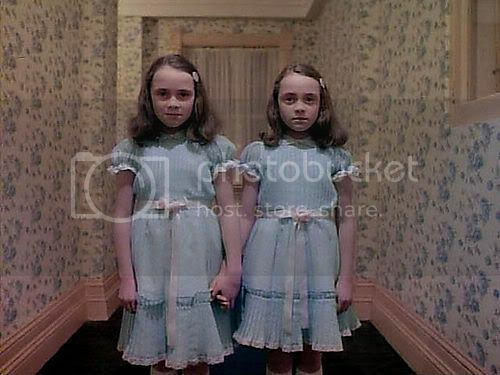 So will the Shining twin be the Annointed? Top photo, although not actually twins…both are making “horror” in Philippine political scene. where in the world am I???? I thought Loren is in the other side of the fence, and there here is this pre-SONA commentary that seems to show that there’s a new tandem in town. nangangamoy 2010 na ba talaga? I thought Loren is in the other side of the fence, and there here is this pre-SONA commentary that seems to show that thereÃ¢â‚¬â„¢s a new tandem in town. Ang pinaka epektibo gamit para sa Kalaban an iyong titanawag no “mole” sa gitna nila. Loren maybe just the ideal mole, a spy amongst us, yon na ngayon ang nasa isip nang opposition. Kaya ito si GMA pauwi na, ang kalaban patungo pa lang. sneaky, sneaky woman. pero hindi ba parang lumipat naman si Loren sa lumulubog na sulpicio lines ng lagay na yan? i mean, the surveys clearly say big distrust in the Administration and here she is associating with the Admin. He he he, ha ha ha. hahahaha. ang mga bp ninyo, pinatataas ko lang. this is first. I expect that there will be a second mention of “garci” before comment-number-95 on this thread. to equalizer: that columnist Cielito Habito for sure is pro-GMA with him saying that the VAT is good for the poor. I think is is from Ateneo de Manila; I don’t even think he has a masters degree, he is more a politician than a journalist. Di ko napanood “The Shining” makita ko ba yan sa ovguide.com? I worry that the well-meaning advocates of such a move are unwittingly pushing for taking from the poor to give to the rich. There are GMA-loyalists all over the place!!!! Even at the Ateneo. I told you so, hehehe. Loren is a planted in the script of Ces Drilon kidnap, heheh. Better stop before your wife or mother beats you up. UPn, I myself believe that VAT or Good and Services Tax by other name is good, IF the funds are spent wisely..Firstly, it is an Equalization Tax, where those who can afford to pay much can not ” avoid” since they have more disposable income. Let us say for example..individual A has an annual take home income of 30 grands assuming he disposed all of them and all was VATed at 12%=that would be 3,600 while B taking home a 100would be paying 12,000. Also if benefits for these two are equal from the Government, then the VAT is good for the A, the poor. Back sometime years ago GST was introduced with the Promise from the Liberal Government that it will be discontinued after the purpose of its passage has been meet..forgot what was that for. But the income on GST was so good and the poor don’t complain so much, because most basics that they need are exempt and are also entitled to Rebates it was never abolished, only that the past two years because of Budget Surpluses, it was reduced by 2 percentage points from 7%..
Now if revenue from VAT is not going to where it is intended for, and Basic goods which the poor have no choice but to put their meager income are taxed then it is more of regressive than progressive taxation. Also prescription drugs should be exempt and children clothes and needs.. I therfore nominate The Cat to be the next president of the Philippines after Loren! Habito, a UP-grad pro-FVR who agrees with GMA on VAT. Of course, Equalizer may just be rabble-rousing while Habito is analyzing. I am more pissed off at Gloria than ever before after listening to her SENSELESS SONA. If her purpose in her SONA was to show that she cares for her people, I am sorry to rain on her parade, but it was not believable at all ! She doesn’t have the look, much less the face, or voice for that matter, to play the part of being so concerned about the Filipinos. As compared to previous SONAs, Gloria barely had any make-up (notice how her eye bags were so noticeable ! ), wearing only earrings & even her nails were not painted. It was soooooooooo studied. If her spin doctors thought that by Gloria looking kawawa, she would get the sympathy of the people, they are mistaken. No matter what the spin doctors try to do at this point, Gloria’s broken credibility cannot be salvaged anymore ! The recent polls taken by the SWS, Pulse Asia & Ibon Foundation reveal that majority of the people HATE GLORIA. That is her reality. That is the true State of the Nation ! you don’t know Habito? here’s his latest article. This is what we Filipinos must collectively work to change. Of course, a call to collective action is one sure way to diffuse the guilt. Habito is even asking the poor to exert effort, too!!!!! In that sense, cvj will be right if he says that Habito practices elitist hocus-pocus. UPn (at 12:26 am), for starters, i happen to think Habito is right. Having said that, it does not take away the reality that GMA is illegitimate and that elitists are a problem in Philippine society. These facts are not mutually exclusive, you know. OOOOOOHHH… and are we stating that the country was better off with all the male presidents so far? Courtesy of our in-house pro-poor elite. Needed we doubt? of course uPn. he’s not like cvj. he’s a true economist. But I agree with cvj and Habito that the government should not scrap the VAT. Scrapping VAT will predominantly favor the rich, who are after all getting a lot of breaks from internal revenue taxes. And with all the smuggling going on, customs revenues are unreliable, so better have it. And let us say it is the most transparent, equitable, across-the-board tax. Let us just expand subsidies for the poorest during these crisis times. What Pinas needs now (GMA has not solved it, and neither did the administrations of Cory, Ramos, Erap) is the creation of domestic jobs. I watched a few minutes of the film online…ang bagal ng streaming at baka bangugnutin ako tinigil ko na. that the Burns twins are indeed in the cast.Di ko naabutan yung part na me twins,baka extra lang kaya parang wala.O baka bata ka pa nung pinaanood mo yun nakatakip ang mata mo,1980 nine years old pa lang ako nun makapanood lang ako ng ganun via betamax. I personally support VAT or GST Taxation. I pay 13%, 8% Provincial and 5% Federal on most Goods and Services and Only Albertans do not Pay Provincial sales Tax..so far it is not a controversial tax at all, not as controversial as the $25 a month Health Tax imposed 4 years ago for those making more than 20 grands and progressing. Take away Corruptions (allegations or reality) and you can actually see what a 12% rate of VAT can do for Developments and Benefits, it is Huge and the Rich and the Wealthy are paying the Bulk of it. I, too, nearly fell off my chair when I opened this entry and saw the photos. Because I have always been convinced that Loren is going to be another Gloria, maybe even worse. There’s something about Loren. It’s her insincere, ambitious, wily aura. A material girl, too. By the way, my thanks to Manolo for taking time out from his busy sched to be our Keynote speaker during the Manila Session of the Executive Committee of the International Federation of Liberal Youth (IFLRY). That was a wonderful talk you gave, MLQ3, especially on the way you started with the inherent differences in East-West thinking and how both can be reconciled. “We can afford to wait.” Haha, I like that. Would have wanted to see my generation do something rather than wait for the current leadership to die off, but that’s a rather comforting thought. Hopefully, they’ll be ready when the time comes. There was a question I wanted to ask but couldn’t phrase it properly in my mind until we ran out of time. No, its not on the LP thing, haha. We’ve beaten that dead horse lots of times already. rob, what question was that? Any cyber-betting pool yet, this early? As for the VAT and eVAT, their burden is painful, but unavoidable. Habito, the mainstream economists and the business community are right on this point. When the price of gas is going up, based on increases in the price of oil, the first thing that must be done is to conserve. That is to cut down. Easy to say. Difficult to do. But that’s that. The market will force it anyway. Direct subsidies to the poor are not ideal, but they, too, are unavoidable, because there is no other immediate form of relief for them. Using state intervention to lower the price of fuel, on the other hand, to a level below that which we must buy it from foreign markets, is long-term national economic suicide. The country would not be able to sustain such massive market intervention and stay solvent. There would be nothing more colosally short-sighted than to get our country hooked on articifically-priced cheap fuel. This is not what subsidies must be used for. Furthermore, if you really want to encourage the development of non-carbon based alternative and renewable fuels, you must make carbon-based fuels as expensive as socially possible to encourage the shift. If this sounds “elitist,” I’m sorry.